Again, copy/pasted from Wikipedia. Some terms will likely be missing, but this should help with a start. A “just war” was a war considered justifiable by the principles of fetial law (ius fetiale). Because war could bring about religious pollution, it was in itself nefas, “wrong,” and could incur the wrath of gods unless iustum, “just”. The requirements for a just war were both formal and substantive. As a formal matter, the war had to be declared according to the procedures of the ius fetiale. On substantive grounds, a war required a “just cause,” which might include rerum repetitio, retaliation against another people for pillaging, or a breach of or unilateral recession from a treaty; or necessity, as in the case of repelling an invasion. See also Jus ad bellum. The English word “ceremony” derives from the Latin caerimonia or caeremonia, a word of obscure etymology first found in literature and inscriptions from the time of Cicero (mid-1st century BC), but thought to be of much greater antiquity. Its meaning varied over time. Cicero used caerimonia at least 40 times, in three or four different senses: “inviolability” or “sanctity”, a usage also of Tacitus; “punctilious veneration”, in company with cura (carefulness, concern); more commonly in the plural caerimoniae, to mean “ritual prescriptions” or “ritual acts.” The plural form is endorsed by Roman grammarians. In his Etymologiae, Isidore of Seville says that the Greek equivalent is orgia, but derives the word from carendo, “lacking”, and says that some think caerimoniae should be used of Jewish observances, specifically the dietary law that requires abstaining from or “lacking” certain foods. At the traditional public rituals of ancient Rome, officiants prayed, sacrificed, offered libations, and practiced augury capite velato, “with the head covered” by a fold of the toga drawn up from the back. This covering of the head is a distinctive feature of Roman rite in contrast with Etruscan practice or ritus graecus, “Greek rite.” In Roman art, the covered head is a symbol of pietas and the individual’s status as a pontifex, augur or other priest. In classical Latin, carmen usually means “song, poem, ode.” In magico-religious usage, a carmen (plural carmina) is a chant, hymn, spell, or charm. In essence “a verbal utterance sung for ritualistic purposes”, the carmen is characterized by formulaic expression, redundancy, and rhythm. Fragments from two archaic priestly hymns are preserved, the Carmen Arvale of the Arval Brethren and the Carmina Saliaria of the Salii. The Carmen Saeculare of Horace, though self-consciously literary in technique, was also a hymn, performed by a chorus at the Saecular Games of 17 BC and expressing the Apollonian ideology of Augustus. A carmen malum or maleficum is a potentially harmful magic spell. A fragment of the Twelve Tables reading si malum carmen incantassit (“if anyone should chant an evil spell”) shows that it was a concern of the law to suppress malevolent magic. A carmen sepulchrale is a spell that evokes the dead from their tombs; a carmen veneficum, a “poisonous” charm. In magic, the word carmen comes to mean also the object on which a spell is inscribed, hence a charm in the physical sense. Castus is an adjective meaning morally pure or guiltless (English “chaste”), hence pious or ritually pure in a religious sense. Castitas is the abstract noun. Various etymologies have been proposed, among them two IE stems: *k'(e)stos meaning “he who conforms to the prescriptions of rite”; or *kas-, from which derives the verb careo, “I defice, am deprived of, have none…” i.e. vitia. In Roman religion, the purity of ritual and those who perform it is paramount: one who is correctly cleansed and castus in religious preparation and performance is likely to please the gods. Ritual error is a pollutant; it vitiates the performance and risks the gods’ anger. Castus and castitas are attributes of the sacerdos (priest), but substances and objects can also be ritually castus. A priest or officiant who was cinctus Gabinus wore his toga bound around the waist in a “Gabinian cincture”, a particular belting for a vestment that was derived from the practice of Gabii. This style of fastening left both hands free to perform ritual tasks, as the wearing of the toga usually did not. The cincture accompanied the veiling or covering of the head (capite velato) with a cowl-like fold of the toga. Like the conical, helmet-like headgear worn by priests such as the Salii, the Gabinian cincture was originally associated with warriors, and was worn for a solemn declaration of war. It was also part of Etruscan priestly dress. Clavum fingere (“to nail in, to fasten or fix the nail”) was an expression that referred to the fixing or “sealing” of fate. A nail was one of the attributes of the goddess Necessitas and of the Etruscan goddess Athrpa (Greek Atropos). According to Livy, every year in the temple of Nortia, the Etruscan counterpart of Fortuna, a nail was driven in to mark the time. In Rome, the senior magistrate on the Ides of September drove a nail called the clavus annalis (“year-nail”) into the wall of the Temple of Jupiter Optimus Maximus. The ceremony occurred on the dies natalis (“birthday” or anniversary of dedication) of the temple, when a banquet for Jove (Epulum Jovis) was also held. The nail-driving ceremony, however, took place in a templum devoted to Minerva, on the right side of the aedes of Jupiter, because the concept of “number” was invented by Minerva and the ritual predated the common use of written letters. The importance of this ritual is lost in obscurity, but in the early Republic it is associated with the appointment of a dictator clavi figendi causa, “dictator for the purpose of driving the nail,” one of whom was appointed for the years 363, 331, 313, and 263 BC. Livy attributes this practice to religio, religious scruple or obligation. It may be that in addition to an annual ritual, there was a “fixing” during times of pestilence or civil discord that served as a piaculum. Livy says that in 363, a plague had been ravaging Rome for two years. It was recalled that a plague had once been broken when a dictator drove a ritual nail, and the senate appointed one for that purpose. The ritual of “driving the nail” was among those revived and reformed by Augustus, who in 1 AD transferred it to the new Temple of Mars Ultor. Henceforth a censor fixed the nail at the end of his term. Septemviri epulonum, the board of seven priests who organized public banquets for religious holidays. Augustus was a member of all four collegia, but limited membership for any other senator to one. In Roman society, a collegium might also be a trade guild or neighborhood association; see Collegium (ancient Rome). The comitia calata (“calate assemblies”) were non-voting assemblies (comitia) called for religious purposes. The verb calare, originally meaning “to call,” was a technical term of pontifical usage, found also in calendae (Calends) and calator. According to Aulus Gellius, these comitia were held in the presence of the college of pontiffs in order to inaugurate the rex (the king in the Regal Period or the rex sacrorum in the Republic) or the flamines. The pontifex maximus auspiciated and presided; assemblies over which annually elected magistrates presided are never calata, nor are meetings for secular purposes or other elections even with a pontiff presiding. The comitia calata were organized by curiae or centuriae. The people were summoned to comitia calata to witness the reading of wills, or the oath by which sacra were renounced (detestatio sacrorum). They took no active role and were only present to observe as witnesses. Mommsen thought the calendar abbreviation QRCF, given once as Q. Rex C. F. and taken as Quando Rex Comitiavit Fas, designated a day when it was religiously permissible for the rex to “call” for a comitium, hence the comitia calata. The Commentaries of the Augurs were written collections probably of the decreta and responsa of the college of augurs. Some scholarship, however, maintains that the commentarii were precisely not the decreta and responsa. The commentaries are to be distinguished from the augurs’ libri reconditi, texts not for public use. The books are mentioned by Cicero, Festus, and Servius Danielis. Livy includes several examples of the augurs’ decreta and responsa in his history, presumably taken from the commentarii. The Commentaries of the Pontiffs contained a record of decrees and official proceedings of the College of Pontiffs. Priestly literature was one of the earliest written forms of Latin prose, and included rosters, acts (acta), and chronicles kept by the various collegia, as well as religious procedure. It was often occultum genus litterarum, an arcane form of literature to which by definition only priests had access. The commentarii, however, may have been available for public consultation, at least by senators, because the rulings on points of law might be cited as precedent. The public nature of the commentarii is asserted by Jerzy Linderski in contrast to libri reconditi, the secret priestly books. The commentarii survive only through quotation or references in ancient authors. These records are not readily distinguishable from the libri pontificales; some scholars maintain that the terms commentarii and libri for the pontifical writings are interchangeable. Those who make a distinction hold that the libri were the secret archive containing rules and precepts of the ius sacrum (holy law), texts of spoken formulae, and instructions on how to perform ritual acts, while the commentarii were the responsa (opinions and arguments) and decreta (binding explications of doctrine) that were available for consultation. Whether or not the terms can be used to distinguish two types of material, the priestly documents would have been divided into those reserved for internal use by the priests themselves, and those that served as reference works on matters external to the college. Collectively, these titles would have comprised all matters of pontifical law, ritual, and cult maintenance, along with prayer formularies and temple statutes. See also libri pontificales and libri augurales. Coniectura is the reasoned but speculative interpretation of signs presented unexpectedly, that is, of novae res, “novel information.” These “new signs” are omens or portents not previously observed, or not observed under the particular set of circumstances at hand. Coniectura is thus the kind of interpretation used for ostenta and portenta as constituting one branch of the “Etruscan discipline“; contrast observatio as applied to the interpretation of fulgura (thunder and lightning) and exta (entrails). It was considered an ars, a “method” or “art” as distinguished from disciplina, a formal body of teachings which required study or training. The origin of the Latin word coniectura suggests the process of making connections, from the verb conicio, participle coniectum (con-, “with, together”, and iacio, “throw, put”). Coniectura was also a rhetorical term applied to forms of argumentation, including court cases. The English word “conjecture” derives from coniectura. Consecratio was the ritual act that resulted in the creation of an aedes, a shrine that housed a cult image, or an ara, an altar. Jerzy Linderski insists that the consecratio should be distinguished from the inauguratio, that is, the ritual by which the augurs established a sacred place (locus) or templum (sacred precinct). The consecration was performed by a pontiff reciting a formula from the libri pontificales, the pontifical books. One component of consecration was the dedicatio, or dedication, a form of ius publicum (public law) carried out by a magistrate representing the will of the Roman people. The pontiff was responsible for the consecration proper. Decreta (plural) were the binding explications of doctrine issued by the official priests on questions of religious practice and interpretation. They were preserved in written form and archived. Compare responsum. A delubrum was a shrine. Varro says it was a building that housed the image of a deus, “god”, and emphasizes the human role in dedicating the statue. According to Varro, the delubrum was the oldest form of an aedes, a structure that housed a god. It is an ambiguous term for both the building and the surrounding area ubi aqua currit (“where water runs”), according to the etymology of the antiquarian Cincius. Festus gives the etymology of delubrum as fustem delibratum, “stripped stake,” that is, a tree deprived of its bark (liber) by a lightning bolt, as such trees in archaic times were venerated as gods. The meaning of the term later extended to denote the shrine built to house the stake. Compare aedes, fanum, and templum. Isidore connected the delubrum with the verb diluere, “to wash”, describing it as a “spring-shrine”, sometimes with annexed pool, where people would wash before entering, thus comparable to a Christian baptismal font. When a person passed from one gens to another, as for instance by adoption, he renounced the religious duties (sacra) he had previously held in order to assume those of the family he was entering. The ritual procedure of detestatio sacrorum was enacted before a calate assembly. Deus, “god”; dea, “goddess”, plural deae; di or dii, “gods”, plural, or “deities”, of mixed gender. The Greek equivalent is theos, which the Romans translated with deus. Servius says that deus or dea is a “generic term” (generale nomen) for all gods. In his lost work Antiquitates rerum divinarum, assumed to have been based on pontifical doctrine, Varro classified dii as certi, incerti, praecipui or selecti, i.e. “deities whose function could be ascertained”, those whose function was unknown or indeterminate, main or selected gods. Compare divus. For etymological discussion, see Deus and Dyeus. See also List of Roman deities. The devotio was an extreme form of votum in which a Roman general vowed to sacrifice his own life in battle along with the enemy to chthonic deities in exchange for a victory. The most extended description of the ritual is given by Livy, regarding the self-sacrifice of Decius Mus. The English word “devotion” derives from the Latin. For another votum that might be made in the field by a general, see evocatio. A Roman emperor‘s dies imperii was the date on which he assumed imperium, that is, the anniversary of his accession as emperor. The date was observed annually with renewed oaths of loyalty and vota pro salute imperatoris, vows and offerings for the wellbeing (salus) of the emperor. Observances resembled those on January 3, which had replaced the traditional vows made for the salus of the republic after the transition to one-man rule under Augustus. The dies imperii was a recognition that succession during the Empire might take place irregularly through the death or overthrow of an emperor, in contrast to the annual magistracies of the Republic when the year was designated by the names of consuls serving their one-year term. The dies Augusti or dies Augustus was more generally any anniversary pertaining to the imperial family, such as birthdays or weddings, appearing on official calendars as part of Imperial cult. References to a dies Caesaris are also found, but it is unclear whether or how it differed from the dies Augusti. The dies lustricus (“day of purification”) was a rite carried out for the newborn on the eighth day of life for girls and the ninth day for boys. Little is known of the ritual procedure, but the child must have received its name on that day; funerary inscriptions for infants who died before their dies lustricus are nameless. The youngest person found commemorated on a Roman tombstone by name was a male infant nine days old (or 10 days in Roman inclusive counting). Because of the rate of infant mortality, perhaps as high as 40 percent, the newborn in its first few days of life was held as in a liminal phase, vulnerable to malignant forces (see List of Roman birth and childhood deities). Socially, the child did not exist. The dies lustricus may have been when the child received the bulla, the protective amulet that was put aside when a boy passed into adulthood. A dies natalis was a birthday (“natal day”; see also dies lustricus above) or more generally the anniversary of a founding event. The Romans celebrated an individual’s birthday annually, in contrast to the Greek practice of marking the date each month with a simple libation. The Roman dies natalis was connected with the cult owed to the Genius. A public figure might schedule a major event on his birthday: Pompeius Magnus (“Pompey the Great”) waited seven months after he returned from his military campaigns in the East before he staged his triumph, so he could celebrate it on his birthday. The coincidence of birthdays and anniversaries could have a positive or negative significance: news of Decimus Brutus‘s victory at Mutina was announced at Rome on his birthday, while Caesar’s assassin Cassius suffered defeat at Philippi on his birthday and committed suicide. Birthdays were one of the dates on which the dead were commemorated. The date when a temple was founded, or when it was rededicated after a major renovation or rebuilding, was also a dies natalis, and might be felt as the “birthday” of the deity it housed as well. The date of such ceremonies was therefore chosen by the pontiffs with regard to its position on the religious calendar. The “birthday” or foundation date of Rome was celebrated April 21, the day of the Parilia, an archaic pastoral festival. As part of a flurry of religious reforms and restorations in the period from 38 BC to 17 AD, no fewer than fourteen temples had their dies natalis moved to another date, sometimes with the clear purpose of aligning them with new Imperial theology after the collapse of the Republic. The birthdays of emperors were observed with public ceremonies as an aspect of Imperial cult. The Feriale Duranum, a military calendar of religious observances, features a large number of imperial birthdays. Augustus shared his birthday (September 23) with the anniversary of the Temple of Apollo in the Campus Martius, and elaborated on his connection with Apollo in developing his special religious status. A birthday commemoration was also called a natalicium, which could take the form of a poem. 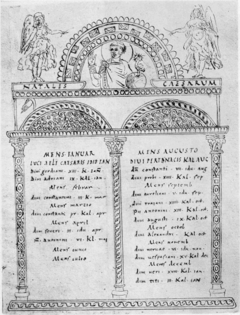 Early Christian poets such as Paulinus of Nola adopted the natalicium poem for commemorating saints. The day on which Christian martyrs died is regarded as their dies natalis; see Calendar of saints. According to Festus, it was wrong (nefas) to undertake any action beyond attending to basic necessities on a day that was religiosus on the calendar. On these days, there were to be no marriages, political assemblies, or battles. Soldiers were not to be enlisted, nor journeys started. Nothing new was to be started, and no religious acts (res divinae) performed. Aulus Gellius said that dies religiosi were to be distinguished from those that were nefasti. The phrase diem vitiare (“to vitiate a day”) in augural practice meant that the normal activities of public business were prohibited on a given day, presumably by obnuntiatio, because of observed signs that indicated defect (morbus; see vitium). Unlike a dies religiosus or a dies ater (“black day,” typically the anniversary of a calamity), a particular date did not become permanently vitiosus, with one exception. Some Roman calendars (fasti) produced under Augustus and up to the time of Claudius mark January 14 as a dies vitiosus, a day that was inherently “vitiated”. January 14 is the only day to be marked annually and officially by decree of the Roman senate (senatus consultum) as vitiosus. LInderski calls this “a very remarkable innovation.” One calendar, the Fasti Verulani (c. 17–37 AD), explains the designation by noting it was the dies natalis of Mark Antony, which the Greek historian and Roman senator Cassius Dio says had been declared ἡμέρα μιαρά (hēmera miara) (= dies vitiosus) by Augustus. The emperor Claudius, who was the grandson of Antony, rehabilitated the day. The adjective dirus as applied to an omen meant “dire, awful.” It often appears in the feminine plural as a substantive meaning “evil omens.” Dirae were the worst of the five kinds of signs recognized by the augurs, and were a type of oblative or unsought sign that foretold disastrous consequences. The ill-fated departure of Marcus Crassus for the invasion of Parthia was notably attended by dirae (see Ateius Capito). In the interpretive etymology of ancient writers, dirae was thought to derive from dei irae, the grudges or anger of a god, that is, divine wrath. Dirae is an epithet for the Furies, and can also mean curses or imprecations, particularly in the context of magic and related to defixiones (curse tablets). In explaining why Claudius felt compelled to ban the religion of the druids, Suetonius speaks of it as dirus, alluding to the practice of human sacrifice. The collective body of knowledge pertaining to the doctrine, ritual practices, laws, and science of Etruscan religion and cosmology was known as the disciplina Etrusca. Divination was a particular feature of the disciplina. The Etruscan texts on the disciplina that were known to the Romans are of three kinds: the libri haruspicini (on haruspicy), the libri fulgurales (lightning), and the libri rituales (ritual). Nigidius Figulus, the Late Republican scholar and praetor of 58 BC, was noted for his expertise in the disciplina. Extant ancient sources on the Etrusca disciplina include Pliny the Elder, Seneca, Cicero, Johannes Lydus, Macrobius and Festus. The adjective divus, feminine diva, is usually translated as “divine.” As a substantive, divus refers to a “deified” or divinized mortal. Both deus and divus derive from Indo-European *deywos, Old Latin deivos. Servius confirms that deus is used for “perpetual deities” (deos perpetuos), but divus for people who become divine (divos ex hominibus factos). While this distinction is useful in considering the theological foundations of Imperial cult, it sometimes vanishes in practice, particularly in Latin poetry; Vergil, for instance, mostly uses deus and divus interchangeably. Varro and Ateius, however, maintained that the definitions should be reversed. See also Imperial cult: Divus, deus and the numen. The formula do ut des (“I give that you might give”) expresses the reciprocity of exchange between human being and deity, reflecting the importance of gift-giving as a mutual obligation in ancient society and the contractual nature of Roman religion. The gifts offered by the human being take the form of sacrifice, with the expectation that the god will return something of value, prompting gratitude and further sacrifices in a perpetuating cycle. The do ut des principle is particularly active in magic and private ritual. Do ut des was also a judicial concept of contract law.